"The puppet draws its origins from one of the most primitive and original forms of art: the play, not the representation of the sacred, as it was sometimes understood. Puppetry is born from a genre of performance that is objective, spontaneous, transparent, naturally becoming increasingly complex as it has adopted various forms and contents." 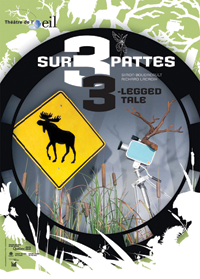 Premiered in November 2010 at the Les Coups de Théâtre international youth theatre festival in Montréal, Sur 3 pattes / 3-Legged-Tale – a show without words – continues its international expansion. A first visit to Hong Kong and Macao in 2013 helped establish contacts that led to the organization of an eleven-show tour of mainland China and Taiwan. The Guangzhou Opera House (pronounced gouang-cho: 广州大剧院, formerly Canton) will host Théâtre de l’Œil as of July 6. Open since 2001, the Guangzhou Opera House is one of China’s most prestigious national theatres, after Shanghai and Beijing. Prestigious companies such as Les Grands Ballets Canadiens in 2011 and Ottawa’s National Arts Centre Orchestra in 2013 have performed on its stage. Afterwards, 3-Legged Tale will be performed five times in Taiwan, as part of the 15th edition of the Taipei Children's Arts Festival, an international festival held every year in July that hosts companies from around the world. No stranger to Québec Theatre, the festival has previously featured performances by companies such as Le Carrousel and Théâtre des Confettis. The tour will make its final stop in Chiayi City in southwestern Taiwan, at the Chiayi Performing Arts Center, a huge complex dedicated to the arts that opened in 2005. It is the brainchild of, among others, Lin Hwai-min, artistic director of the renowned Cloud Gate Dance Theatre of Taiwan. The Cloud Gate performed its famous show Songs of the Wanderers at Montréal’s Place des Arts in March, during which 3.5 tons of golden rice rained down on the stage. 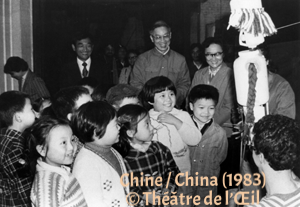 Let’s not forget that Théâtre de l’Œil was the first Canadian company to visit mainland China, with the show Regarde pour voir, back in 1983. This is the company’s eighth Asian tour. By the end of the trip, three different shows will have been performed a total of 90 times in the cities of Nanjing, Shanghai, Beijing, Hong Kong, Macao, Guangzhou, Taipei and Chiayi (China), in Tokyo, Iida, Shimojyo, and Nakagawa (Japan) as well as in Seoul (South Korea). Of course, meetings with Québec and Canadian officials, the audience, presenters and puppetry arts professionals are planned throughout the company’s one-month tour. * This tour is made possible with the support of the Conseil des arts et des lettres du Québec and the Canada Council for the Arts. In December 2013, André Laliberté and his team learned that among all the companies subsidized by the organization, Théâtre de l’Œil was shortlisted as a finalist for the Grand Prix du Conseil des arts de Montréal. 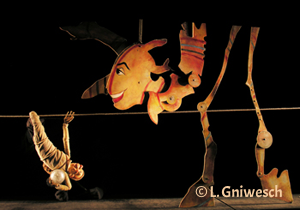 The company was commended “for the international scope of its productions and its major influence on the development of the art of puppetry in Québec in the past 40 years,” as stated in the CAM press release. Théâtre de l’Œil was honoured to be the subject of a full-page report published in the daily paper Le Devoir’s special section on the 29th Grand Prix du Conseil des arts de Montréal finalists (IN FRENCH. 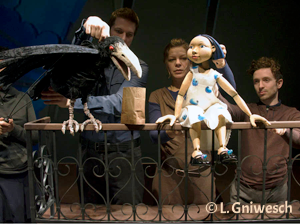 To mark Théâtre de l’Œil’s 40th anniversary, the Les Trois Jours de Casteliers international puppet festival invited the company to display some of its puppets at the Théâtre Outremont, in Montréal, from March 6 to 9. 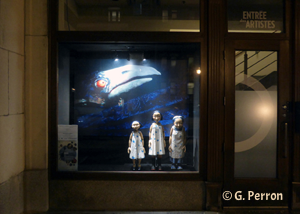 The characters from the show Corbeau – Nukum at three stages in her life – were presented in the theatre window and attracted much attention. Inside, puppets and posters from eight memorable shows were on display. During the festival’s opening night ceremonies, festival director Louise Lapointe honoured Théâtre de l’Œil artistic director André Laliberté in her speech and invited him to take the floor. She also offered guests a piece of delicious birthday cake, a kind and heart-warming gesture. 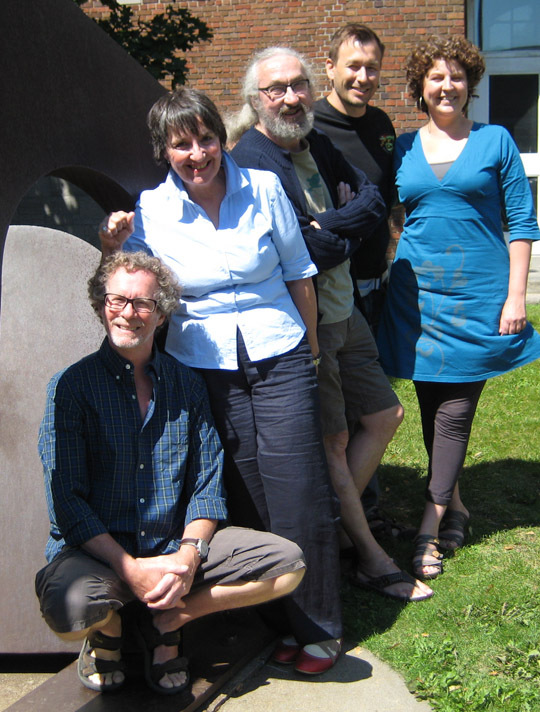 Let’s wrap up our 40th anniversary celebrations! 2013-2014 was Théâtre de l’Œil’s 40th anniversary season. 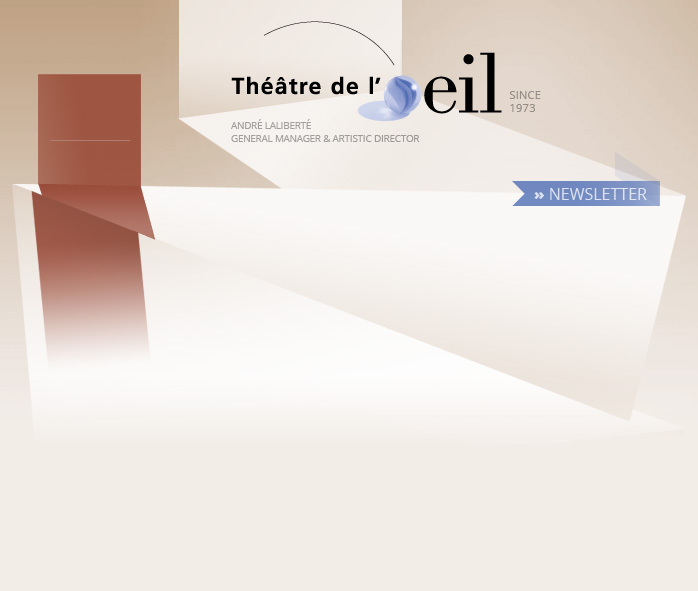 With three shows on the road, a show in the works and another slated for a comeback, Théâtre de l’Œil’s creativity and activities testify to the company’s youthful energy despite the years! Gilbert David, Spirale, Winter 2014. In October, Corbeau was off on tour to perform in Réseau Scènes’ tried-and-true venues. From l’Assomption to Saint-Jean-sur-Richelieu, from Joliette to Sherbrooke and from Belœil to Longueuil by way of Trois-Rivières, it is always a pleasure to work with local presenters who make it possible to reach out to the public. Corbeau, the company’s fifth production to be part of the program, ended its first touring season in early May during the 10th edition of the Petits bonheurs (small pleasures) festival in Montréal, which was, of course, a GREAT pleasure! In January, Sur 3 pattes made a couple of stops in Saint-Jérôme and Sainte-Thérèse, and toured Montréal as part of the Conseil des arts de Montréal’s Touring Program. Performances for family audiences of all three touring shows gave Théâtre de l’Œil the opportunity throughout the season to reach out to the public, present the puppets, answer children’s questions and offer families a set of 25 postcards of the company’s productions. 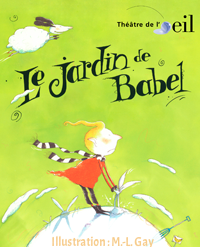 From September 24 to October 12, 2014, Le jardin de Babel will return to the Maison Théâtre stage. First premiered in 1999, Le jardin de Babel had a three-season run. The play tells the story of a fantastical adventure in an imaginary garden. A modern fairy tale in which princesses are not necessarily charming and heroes become heroes… despite themselves. 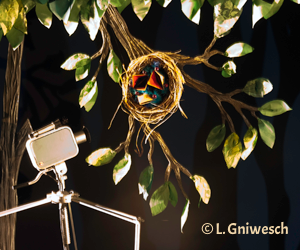 The story, scenography and puppets are the work of Marie-Louise Gay, who also wrote two other plays for the company: Bonne fête Willy in 1988 and Qui a peur de Loulou? in 1993. Théâtre de l’Œil’s next production, an adaptation of Hans Christian Anderson’s The Snow Queen, will be penned by Étienne Lepage and stage-directed by Catherine Vidal. It is scheduled to premier in the fall of 2015. Catherine performed and manipulated the Giant Henrietta Alformi in Ah, la vache ! / Holy Cow! (2007). She went on to do many very interesting projects, like stage-directing Le Grand Cahier, a show that premiered at Théâtre Prospero and then toured across Québec before taking the stage at Théâtre de Quat’Sous. In collaboration with Étienne Lepage, she presented an adaptation of a pastoral play, Le Jeu de Robin et Marion, at Théâtre d'Aujourd'hui. As for Étienne Lepage, this will be his first collaboration with Théâtre de l’Œil, although it is not his first foray into writing for young audiences. He co-wrote Éclats et autres libertés (Théâtre Le Clou), a show for teenagers, and he penned Histoires pour faire des cauchemars, a cheeky story wonderfully staged by the Belgian companies Barakha and Fastabl. wishes you a great summer! Théâtre de l'Œil gratefully acknowledges the financial support of the Conseil des arts et des lettres du Québec, The Canada Council for the Arts and the Conseil des arts de Montréal.